Empowering girls through mobile with the information, connections, tools and services they need to transform their lives. Globally, mobile is revolutionising life even among some of the most marginalised groups. But girls are at the back of the queue when it comes to accessing mobile which means they get more of the risks but fewer, if any, of the benefits. Girl Effect and Vodafone Foundation have teamed up to empower 7m vulnerable girls across eight countries with access to the services they need through mobile. Working together with multiple partners and funders, the partnership aims to generate total funds of up to $25m over five years, including a $5m contribution from Vodafone Foundation. Mobile can put unprecedented power in a girl’s hands, helping her feel safer, more connected, and find information and opportunities in areas of her life from health to financial services and employment opportunities. Closing the mobile gender gap will dramatically improve the lives of girls, their families and communities, and contribute towards the United Nations Sustainable Development Goals. The five-year partnership launched in September 2018 with the first-ever global study into adolescent girls and mobile phones, previewed at the Social Good Summit, in advance of the full report release on 11 October 2018, International Day of the Girl. The survey presented the most detailed picture to date of girls and mobile, along with recommendations for how to best use mobile in development interventions. 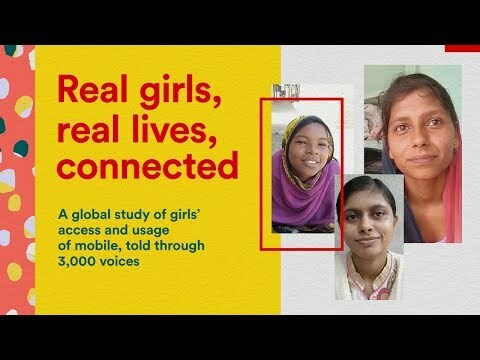 A global study, created by Girl Effect and Vodafone Foundation, explores how girls in 25 countries are accessing and using mobile phones. Through Girl Effect’s technology and brands, the partnership will expand the reach of Springster, Girl Effect’s mobile platform, across eight countries in Africa and India, targeting vulnerable girls aged 14-19. Through the partnership, the Springster platform will be turbo-charged with new features and content, including an IVR line for girls with no online access, and a chatbot to host sensitive conversations in a private space. Partnerships will be forged with service providers to connect girls with on-the-ground services. Girl Effect and Vodafone's partnership will also kickstart a new youth brand in India, delivering powerful digital content to girls on issues such as sexual health and employment. The partnership will reach over 7m girls in total across India, Tanzania, DRC, Kenya, Ghana, South Africa, Mozambique, and Lesotho. We will measure the impact of the partnership by closely examining metrics like reach, engagement, participation and impact, using a range of quantitative and qualitative methods, including analytics, comment analysis, surveys, and in-person qualitative sessions. In Tanzania and India, we will also measure the number of girls accessing services through our mobile activity, and map behaviour and attitude changes back to content. Long-term the partnership will add to the growing body of evidence and insight around how girls are using mobile phones, and how digital interventions can drive behaviour change. Learn more about Girl Effect's partners.